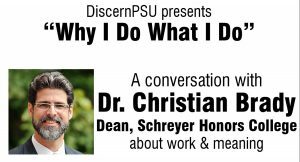 The discernPSU lecture series invites public figures from the university and State College community to present a brief lecture, followed by an opportunity for audience questions. 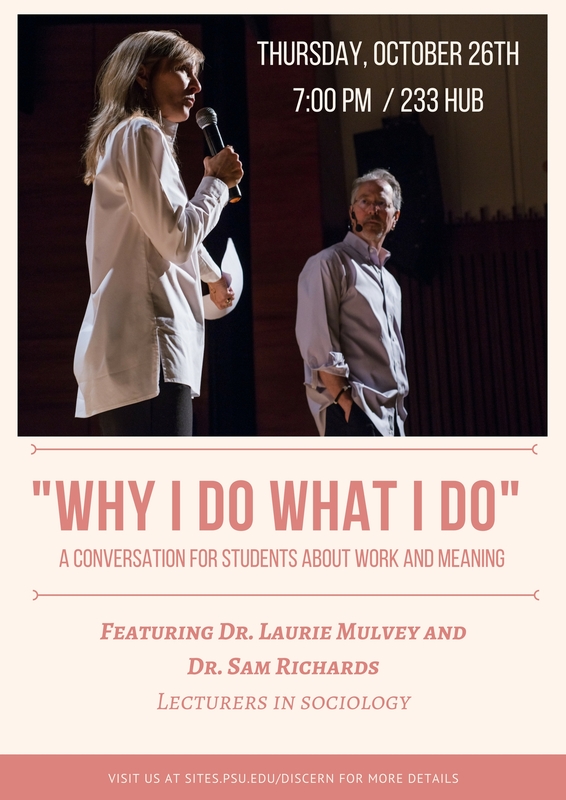 Presenters talk about the work they do, how they discovered their vocation, and how this work reflects and fulfills their values and beliefs. Lectures will be offered once each semester. Here are all of the past speakers that have participated in our series. 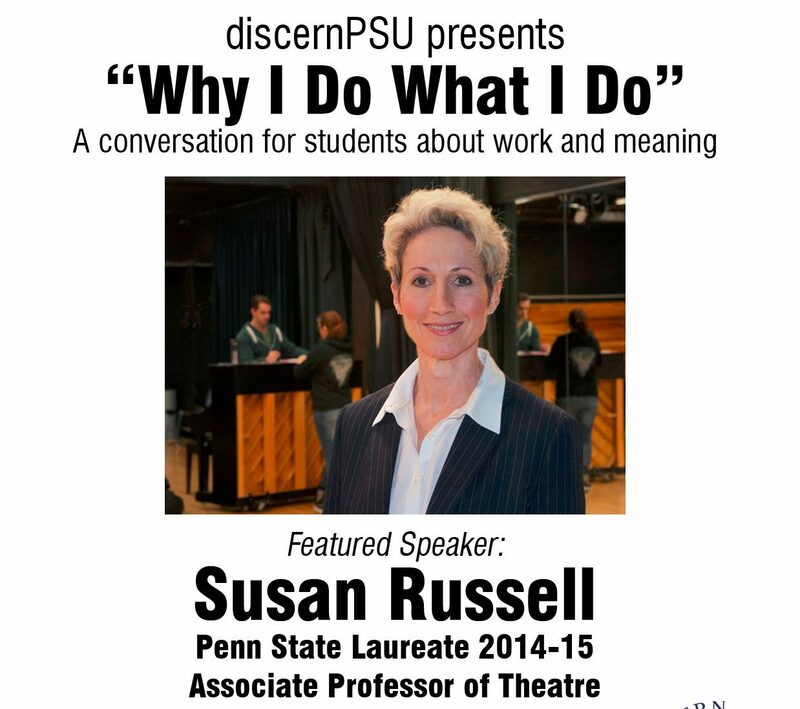 Lori Miraldi – DiscernPSU’s spring 2019 “Why I Do What I Do” event featured Lori Miraldi, a lecturer in the Communication Arts and Sciences department at Penn State and Director of Engineering Ambassadors Program and Student Engagement Initiatives. Miraldi spoke about the work she does, how she discovered her vocation, and how this work reflects and fulfills her values and beliefs. She also gave insight as to how she was able to overcome struggles with her mental health and the importance of close relationships. 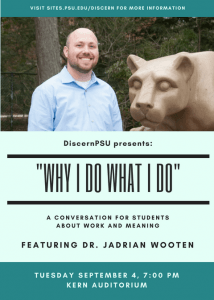 Dr. Jadrian Wooten – Jadrian is currently an assistant teaching professor at Penn State, and is most popular for his enthusiastic lectures in microeconomics. 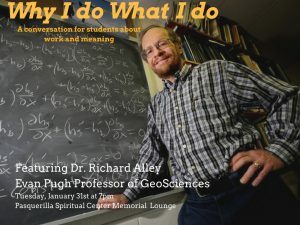 He’s grown to become a favorite amongst students for his demonstrations in class, and is most noted for having his students practice class concepts by outbidding each other for donuts each semester. Outside of teaching, Dr. Wooten has also conducted numerous research projects, and is most interested in managerial and labor related issues in sports and teaching pedagogy. He is additionally involved in developing teaching resources for university and high school economics instructors. 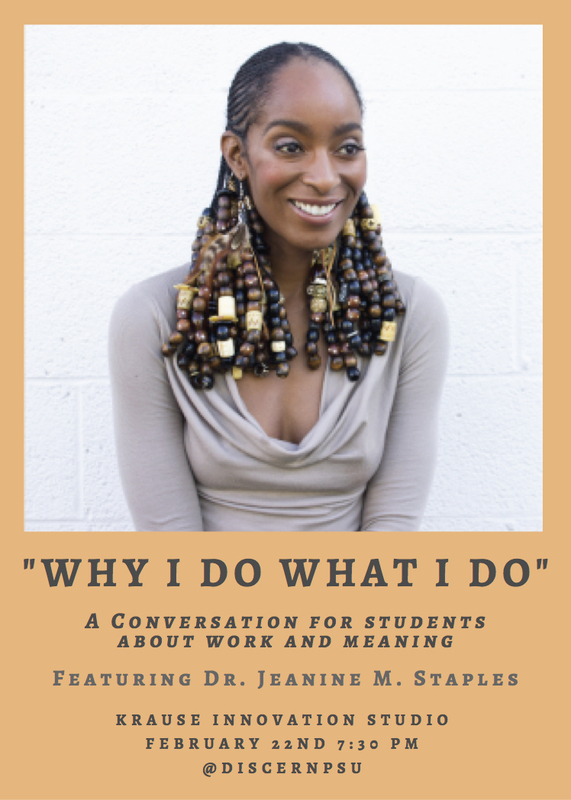 Dr. Jeanine Staples – Jeanine is Associate Professor of Literacy and Language, African American Studies, and Women’s, Gender, and Sexuality Studies at the Pennsylvania State University. Her debut book, The Revelations of Asher: Towards Supreme Love in Self, explores Black women’s terror in love. As a precedent to the book, she introduced the concept of “figurative deaths” in her acclaimed 2014 TEDx talk. It is entitled, “How to Die Peacefully.” Dr. Staples has dozens of publications and has spoken globally about how new literacies education can support personal and public justice work. 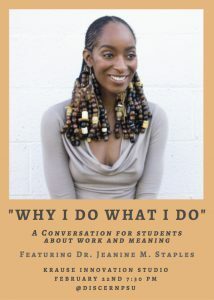 She has trained over 3500 teachers of underrepresented minority students in cutting edge, anti-racist, anti-sexist, anti-ableist methods of instruction and assessment. She is an expert in research on marginalized women and girls, particularly with regard to understanding lover identity, developing emotional literacy, and promoting emotional justice for social justice. Dr. Laurie Mulvey and Dr. Sam Richards – Both Dr. Laurie Mulvey and Dr. Sam Richards are lectures of sociology, and have worked together to direct the World In Conversation Center for Public Diplomacy at Penn State, which has become the largest university-based cross-cultural dialogue program in the U.S. Dr. Richards teaches the largest race relations course in the United States, and even made his way into David Horowitz’s book, “The Professors: The 101 Most Dangerous Academics in America.” Dr. Laurie Mulvey is the executive director of World in Conversation, and her Social Conflict course at Penn State inspired the Center’s global dialogues which have attracted the interest of partners such as UNDP and NATO, and local and regional organizations in Pakistan, Iraq, Kuwait, Egypt, and various others. Live Stream the event HERE! Evan Pugh Professor Richard Alley – Dr. Richard Alley has authored more than 240-referred scientific publications about the relationships between Earth’s cryosphere and global climate change. Alley has received many awards including the Heinz Award, the Seligman Crystal and was elected to the National Academy of Sciences in 2008. His many research interests include glaciology, ice and climate, sea level change and abrupt climate change. 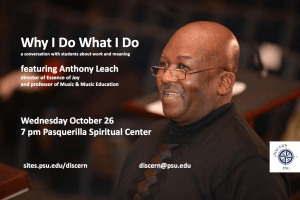 Dr. Anthony Leach – Dr. Anthony Leach is the director of Essence of Joy, a world-renowned choral group on campus. He earned his master’s and PhD in conducting and music education from Penn State. Now he teaches graduate courses in music education and was honored to serve as Penn State Laureate during the 2009-1020 academic year. Dr. Leach is also artist-in-residence at New Bethel Baptist Church in Washington, D.C.
Russ Rose – Russ Rose, 7-time NCAA Champion, spoke in April 2016 about his work as head coach of the Penn State women’s volleyball team. Rose has coached the team since 1979 with the most wins and highest winning percentage of any Penn State intercollegiate athletic coach in Penn State history. 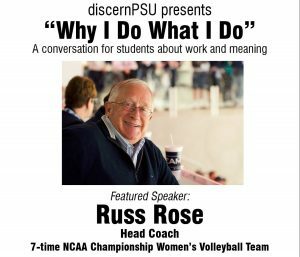 In addition to being a great volleyball coach, Rose is a professor in the Health and Human Development department and teaches a sports ethics class. Dean Christian Brady – Dr. Christian Brady is the Dean of the Schreyer Honors College and an associate professor of Classics & Ancient Mediterranean Studies and Jewish Studies at Penn State. He specializes in biblical literature, rabbinic literature and targum. Dr. Brady has raised over $80 million for honors education at Penn State to rebrand the college, develop new student engagement opportunities and increase applications to the college. Susan Russell – Dr. Susan Russell is an associate professor of theatre in the College of Arts and Architecture and was recently named the 2014-15 Penn State Laureate. She was also honored with the Penn State Commission for Women’s Faculty Award for her work on women’s issues at Penn State and throughout the surrounding community. During her Laureate year, Dr. Russell brought the Penn State community together for ongoing conversations about the concept and practice of dignity. Mike the Mailman – Our first lecture series event was a discussion with campus celebrity Mike the Mailman. Mike Herr has served in the postal industry for 48 years and retired on April 1, 2016. He impacted students and the entire Penn State community with his infectious smile, and kind, helpful manner. Herr is writing a book, spending time with his family and enjoying retirement. 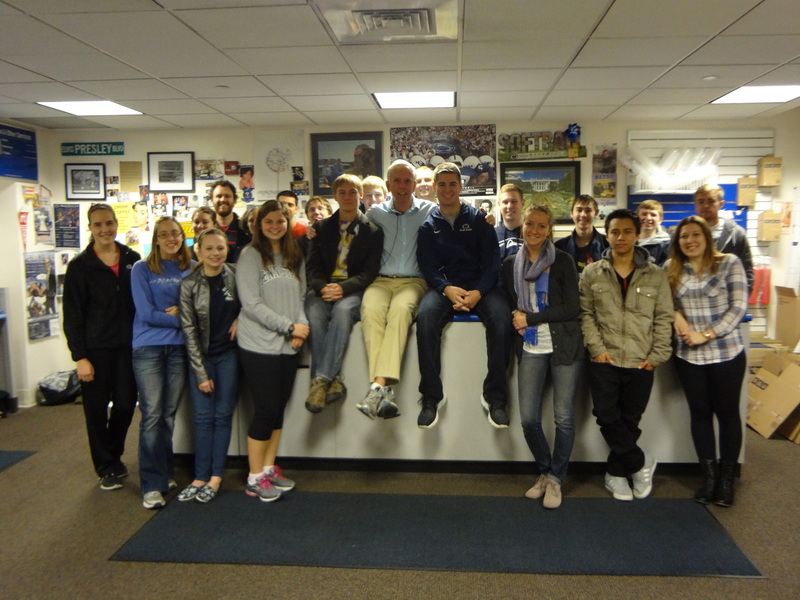 Mike Herr sits with Penn State students in the University Park post office after speaking at the first “Why I Do What I Do” event.